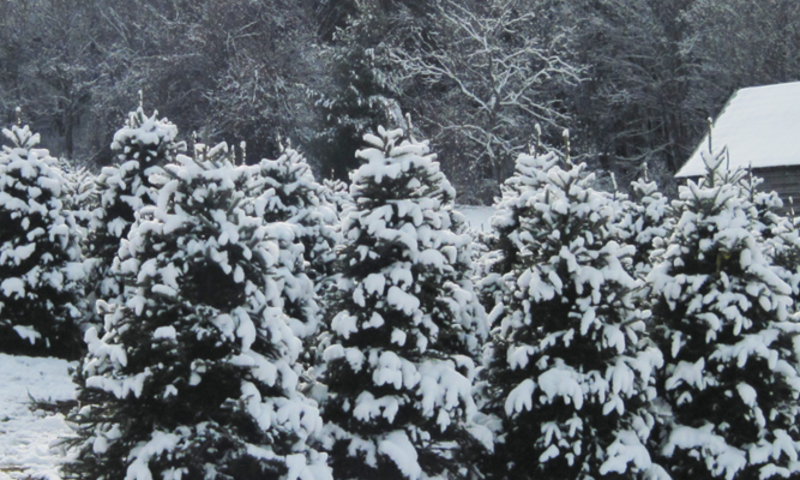 GO GREEN & Buy REAL CHRISTMAS TREES and support our economy! Almost all fake Christmas Trees (Almost 85+%) are imported from China. Made with petroleum based materials that will last in our landfills for 100’s and 100’s of years after they are dumped. The History of the Fraser Fir Christmas Tree. The oldest record of a decorated Christmas tree came from a 1605 diary found in Strasburg, France (Germany in 1605). The tree was decorated with paper roses, apples and candies. In Austria & Germany during the seventeenth and eighteenth centuries, the tops of evergreens were cut and hung upside down in a living room corner. They were decorated with apples, nuts and strips of red paper. In 1834, Queen Victoria’s husband, Prince Albert, was credited with bringing the first Christmas tree to Windsor Castle for the Royal Family. Some historians state that in actuality Queen Charlotte, Victoria’s grandmother, recalled that a Christmas tree was in the Queen’s lodge at Windsor on Christmas Day in 1800. Charles Minnegrode introduced the custom of decorating trees in Williamsburg, Virginia in 1842. Mark Carr brought trees from the Catskills to the streets of New York in 1851, and opened the first retail Christmas tree lot in the United States. Franklin Pierce was the first president to introduce the Christmas tree to the White House in 1856 for a group of Washington Sunday School children. The first national Christmas Tree was lighted in the year 1923 on the White House lawn by President Calvin Coolidge.North Carolina produces over 19% of the real Christmas trees sold in the U.S. The North Carolina Fraser fir Christmas tree is the most popular Christmas tree in North America and is shipped into every state in the country as well as the Caribbean Islands, Canada, Mexico, Bermuda, Japan and other points all over the world. Fraser fir is grown in the far Western North Carolina counties which include Alleghany, Ashe, Avery, Buncombe, Haywood, Henderson, Jackson, Macon, Madison, Mitchell, Swain, Transylvania, Watauga and Yancey. The North Carolina Fraser fir has a deep green color, soft needles, good needle retention, long-lasting aroma, and strong branches for holding heavy ornaments. Fraser Firs are resistant to the stresses of shipping and temperature fluctuations.